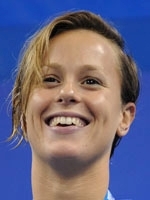 "Double double" world champion in the 200m and 400m freestyle, Italy's Federica Pellegrini is now trying to emulate her feat in the Olympic pool where she goes to the London Games as reigning 200m champion. Since the Beijing Games, she has been virtually untouchable at major competitions with back-to-back double success at the world championships and how fitting it would be if she celebrated her 24th birthday (Aug. 5, the day after the Olympic swimming competition finishes) with more success in London. It has not all been smooth waters for the Italian who has had to overcome a serious of problems in and out of the pool. Since the death of her former coach Alberto Castagnetti from heart problems in October 2009, she has been through a series of coaches and relationships. Stefano Morini was the first man to oversee her career but only lasted until December 2010 before she hooked up with Frenchman Philippe Lucas, the charismatic former coach of 2004 Olympic 400m freestyle champion Laure Manadou. However despite winning the medley double at the 2011 world championships in Shanghai, they parted ways in August that year and Pellegrini moved under the guidance of Federico Bonifacenti where that relationship lasted all of three months. Her love-life is equally complicated for the woman known as "Super-Fede". From March 2007 to the summer of 2011, she was dating Manadou's former boyfriend and Italian swimmer Luca Marin but at the 2011 world championships, she only had eyes for double 100m freestyle world champion (2005, 2007) Filippo Magnini. She is an outright superstar in her home country and her natural beauty and model figure help add glamour to her brilliance in the pool. She won Olympic silver in the 200m freestyle at the 2004 Athens Games before taking gold at Beijing and of course the recent double-doubles at Rome in 2009 and Shanghai in 2011. The 1.79m swimmer thrives on the big occasions and smashed the world record twice during the Beijing Games and again at the 2009 world championships where she became the first woman to break 4mins over 400m when she stopped the clock at 3min 59.15secs. When the Olympic battle begins in the English capital, Pellegrini can already count 11 medals at major long-course competitions (6 including 4 gold at world championships, 5 medals, 2 gold at European championships) and 13 at short-course events (3 at the worlds, 10 and 4 gold at Europeans). She has also set 11 world records over 200m and 400m in long-course and also over 200m in short-course racing. Now she will have to overcome the recent troubles that have sometimes thrown her into disarray and the Venice region native readily admits to overwhelming pressure and panic attacks which can lead to her pulling out of races. "I am starting again from zero but I am calm about my Olympic objectives", she confided after splitting with Bonifacenti to now employ Claudio Rossatto, Magnini's handler.